For those who know what and where Anzio is and maybe even remember its historical significance, you may still be befuddled as to why there would be any connection with Antichrist. (Short Pause: I think that’s the first time I’ve ever used the word befuddled. Mostly because it’s a silly sounding word which reminds me of the cartoon character Elmer Fudd who was always being outwitted by Bugs Bunny. Nevertheless, befuddled is a synonym of confused, baffled, puzzled, bewildered, and so forth)! Well, I hope to calm your curiosity and clarify your confusion by establishing a convincing correlation between Antichrist and Anzio. The best way to do that is to take a brief historical trip to Anzio, Italy of the 20th century, then to go back even further in time to the 1st century. Then back to the future to confirm the connection between Antichrist and Anzio. Fasten your seatbelts; it’s a titillating but turbulent trip. You most likely knew about Anzio. Like me, however, you probably identified it not as just Anzio, but as Anzio Beach. Along with Salerno, Anzio Beach was one of the largest amphibious assaults undertaken by the Allies in World War II. With, of course, the biggest of all at Normandy Beach in France (D-Day, June 6, 1944). Historians agree that the seaside landings in both the European and Pacific theatres of World War II played a major role in the ultimate Allied victory. And some historians have pointed out strategic flaws in Operation Shingle. 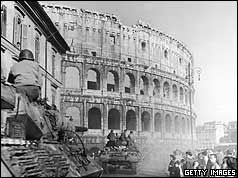 But the fact remains: it led to a decisive defeat of German troops in southern and central Italy followed by the exhilarating liberation of Rome. General Dwight Eisenhower announced the surrender of the Italian Armies on September 8, 1943. Italy dropped out of the war, except for forced conscription of some Italian battalions by the Third Reich. Soon thereafter, Germany responded with Operation Axis. The Germans swept in and occupied most of Italy, including Rome. The Allies countered with Operation Avalanche. Most Italians switched allegiance and embraced the Allies especially the American soldiers; many Italians had relatives or friends in America, via considerable Italian immigration during the 19th and 20th centuries. After the Allies invaded Italy in 1943, the Germans stopped them cold at what was called the Gustav Line at Cassino, Italy. Winston Churchill came up with an idea to attack the line from behind it (from the south). This would require an assault from the Mediterranean Sea. Anzio was selected as a beachhead and the landing took place on January 22, 1944. Time/space does not permit more details of battle defeats and successes, or the Allied good and bad decisions of Operation Shingle. Bottom line is that American soldiers of the 5th Army entered Rome late on June 4; the following day, June 5th, German troops withdrew from the city. Romans wildly celebrated their liberation from German tyranny, even though just a few months earlier their soldiers had been fighting on Germany’s side. The very next day (D-Day, June 6th, 1944) the Allies stormed several beaches at Normandy, France. This triggered the beginning of the end of the Third Reich. During the four-month bloody battle for Italy, German troops actually pushed the Allies back to the beachhead in February, 1944. After a change in command (generals), the Allies regained the offensive including breach of a German line of defense between Rome and Anzio. The name of that defensive line: Caesar Line! 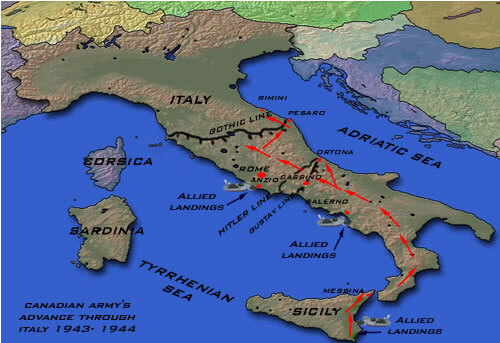 After the fall of Rome to the Allies, some German forces remained in northern Italy until May 2, 1945. American Commander Mark Clark was criticized for “grandstanding” with his main objective of liberating Rome at the expense of what might have been a complete expulsion of German troops from all of Italy. Nonetheless, the Italian Campaign was a major success for the Allies and, ironically, for Italians whose victory was with and from the Allies not against them. The “eternal city” of Rome was liberated with minimal damage to buildings or loss of life to Rome’s civilians. Dozens of World War II movies have been made including one released in 1968 simply called, Anzio. Although the cast was mostly non-Italian actors such as Robert Mitchum, Peter Falk, and Robert Ryan, it was produced by Italian Dino de Laurentiis, and shot mostly in Italy by an Italian film crew. Stay with me while we continue this mysterious journey between Anzio and Antichrist a little longer, so as to peak your interest. Also, in summary fashion, to once again disclose the identity of Antichrist, as established from the astounding evidence found in Scripture and 1st century history. Those who have read my second book, Out of the Abyss and/or just a few articles in the category of Antichrist on the Eye of Prophecy website, will know that the Antichrist revealed in the 1st century and also—because of his incredible reappearance in the near future—the 21st century is none other than the Roman Emperor Nero. By means of meticulous documentation of Scripture and accurate correlation with secular history, we know that Nero was the Man of Lawlessness exposed by the Apostle Paul in II Thessalonians 2. 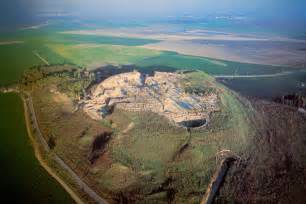 He was the Roman Caesar who personally ordered several of his legions under Generals Vespasian and Titus to crush the Jewish uprising in 66 AD, which led directly to the destruction of Jerusalem and the Temple as prophesied in Daniel Chapter 9. His name in Hebrew gematria spells six hundred, sixty-six as found in Revelation 13. He had already lived and died before John was given the visions of the Antichrist beast in the book of Revelation (Revelation 17:7-8 & 11; Revelation 13:3, 12, 14). Thus he (Nero) is not only one of the seven (five who died) kings (Roman emperors) of Revelation 17, he is also the composite beast himself (Antichrist). In that same 17th Chapter of Revelation, we are told that the Antichrist beast who had already lived and died would reappear from the Abyss to the amazement of those left behind at the Rapture. That same shock and awe is described in Revelation Chapter 13. All of these correlations (and more) between Antichrist and Nero are presented in enormous detail in Out of the Abyss and in various Eye of Prophecy articles. The following passage is John’s first comprehensive vision of the beast of Revelation (called Antichrist only by the Apostle John as found only in his epistle of I John). The second major revelation of the beast is found in Revelation Chapter 17. In my book and some Eye of Prophecy articles, you’ll find extraordinary evidence to show the Abyss is under the oceans or seas. Such as: Soon Comes the Antichrist … Straight From the Abyss, Part I & Part II. (Posted 8-20 & 8-27-16). “Then I saw a beast rising up out of the sea. It had seven heads and ten horns, with ten crowns on its horns … I saw that one of the heads seemed wounded beyond recovery—but the fatal wound was healed! The whole world marveled at this miracle and gave allegiance to the beast. They worshiped the dragon (Satan) for giving the beast such power, and they also worshiped the beast. ‘Who is as great as the beast?’ they exclaimed. ‘Who is able to fight against him?’” Revelation 13:1-4). (Note: One reason masses of people will ask those two questions will stem from the thought: How can you fight against or kill someone who came back from the grave 2000 years later? Their answer: You can’t. Though they won’t know until it’s too late, Nero will not be killed again. He will be thrown into the Lake of Fire alive along with the False Prophet. See Revelation 19:20). Nero is one of the seven heads (kings-Roman Emperors) and like Revelation 17 he is also the composite beast itself. He lost his empire on June 9, 68 AD, when he was killed (fatal wound) by his servant. Nero preferred death over being captured and tortured by Roman soldiers, but he didn’t have the courage to do himself in. His recovery from that deadly blow and return (reappearance) to earth will captivate those left behind to the point of yielding their complete allegiance to this vile man. Mostly, however, I want to direct your attention to the first few words of the just quoted passage: “Then I saw a beast rising up out of the sea…” (Revelation 13:1). Which tracks with the Antichrist beast (Nero) coming up out of the Abyss in Chapter 17, as the Abyss is beneath the sea. As also established in my book and some prior Eye of Prophecy articles with Scriptural and cogent reasons given, the sea here is literal … not figurative. The sea is not the mass of humanity, no more than is the Abyss in Revelation 17 (a very real place, different from Hell). This heading is actually the title of the Eye of Prophecy article posted recently on April 1, 2017. In that article, some fascinating facts were presented reflecting a prominent surge of Nero’s name in just the past few years. Trust me, that article was no April fool’s joke or ruse. 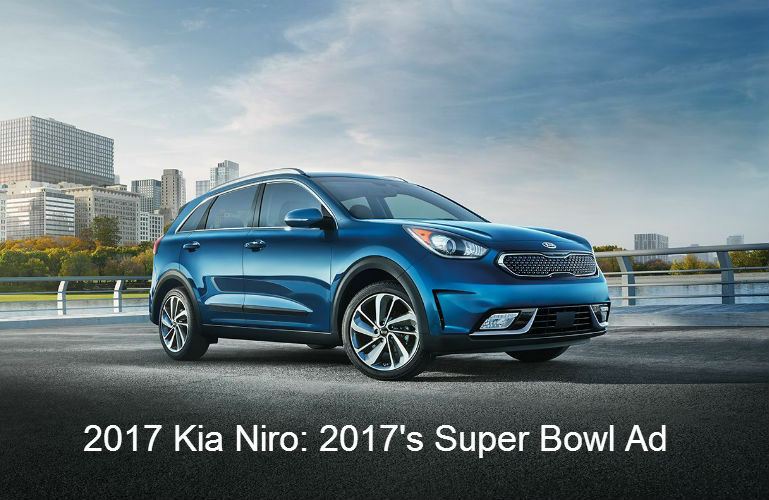 If you’ve ever bought Nero bottled water, Nero tile floor covering, Nero tires, Nero video games, Nero watches and handbags; if you’ve heard about or maybe you’re driving a brand new Kia NIRO or watched the now famous Super bowl automobile commercial earlier this year about NIRO; if you’ve ever purchased software from Nero AG; if you’re tuned in to the music of the rock band NERO; if you’ve seen or belong to one of many organizations whose name is an acronym for N E R O; then you’ll know how prevalent his name is in mainstream media and every-day products. There’s more: A phenomena of late 20th and now 21st century thinking and rethinking of Nero by many people … including professional writers, artists, entrepreneurs, politicians, professors, archeologists, as well as “common” people. 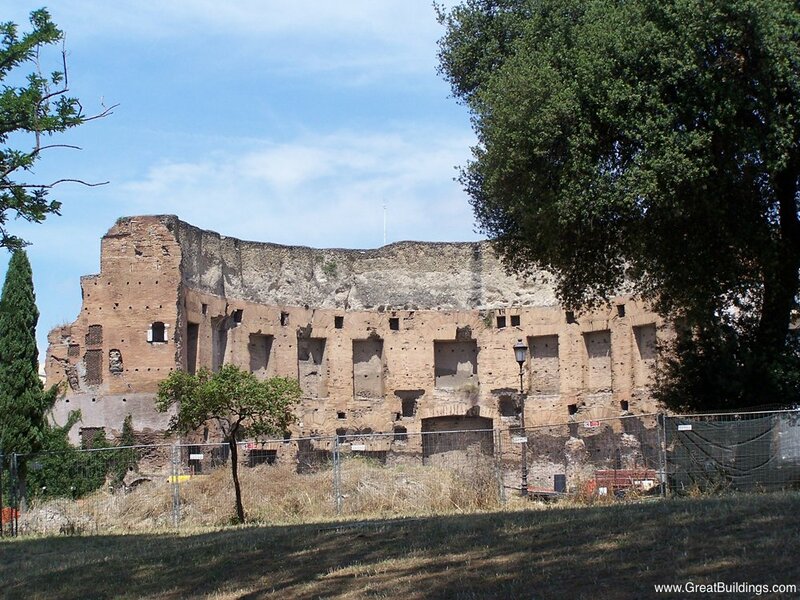 In general the article was about Nero himself; one that included information about partial restoration of Nero’s Golden Palace (Domus Aurea) subsequently opened to the public, but shut down in 2010 due to partial collapse of its roof. (Note: I have no doubt that this exhibit will be reopened before the Rapture or most likely when Nero reappears … he’ll see to it. 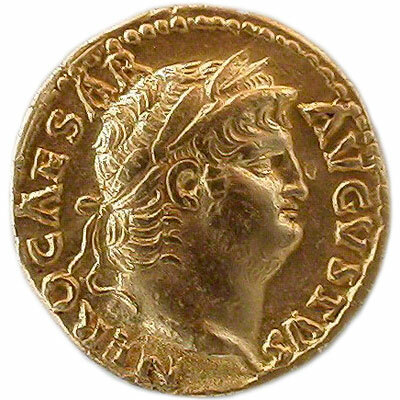 In the context of today’s article—that of conveying a little known fact about the 1st century Roman Emperor Nero, then determining its connection to his reappearance from the Abyssal Sea soon after the Rapture (Antichrist’s link to Anzio)—let’s look at additional content of Robert Draper’s article, Rethinking Nero. What you’re going to see is more alarming authentication that a cross-section of people and professionals from all walks of life are not only trying to “rehabilitate” Nero’s despicably infamous persona and portray him in a much more favorable light, but also (deliberately or inadvertently) reviving the 1st – 5th century belief that Nero would return. Please see Eye of Prophecy article, The Legendary Return of Nero (Posted 4-4-15). Also, the Nero Redivivus Legend was summarized in my article, Nero & the Remarkable Revival of His Name. Robert Draper does try to balance the “multiplying voices who have spurred a reappraisal of Nero” by giving a couple of examples of those who still hold Nero in historical contempt. However, the entire gist of Draper’s article is the astonishing 20th and 21st century resurgence of not only keen interest in Nero but also the desire to radically change the historical perception that Nero was only bad. Then Draper quotes archaeologist Heinz-Jurgen Beste who extolled Nero’s avant-garde creation of “Neronia” an Olympic style poetry, music, and athletic contests. Draper is referring to Italy’s former Prime Minister Silvio Berlusconi, who was convicted in 2013 of tax fraud and who had served as Prime Minister for nine years (over staggered terms), resigning in 2011. There are other examples of the reprehensible rehabilitation of Nero’s so-called respectable even admirable attributes, but let’s look at the chilling conclusion to Robert Draper’s article, Rethinking Nero. “Today it sits at the edge of the sea, a rather stunning representation of the emperor in his early 20s, well over six feet tall, standing in his toga on a pillar, his eyes intent as his extended right arm points toward the water in all its splendid mystery. The plaque gives his full ruling name in Italian—Nerone Claudio Cesare Augusto Germanico…. Then, after describing his lineage, it says, ‘During his reign the empire enjoyed a period of peace, of great splendor, and of important reforms’” (Italics for emphasis). Note that I stopped at the end of Nero’s full name, and resumed with, “Then, after describing his lineage…” Why did I stop there? Answer: For the suspenseful reason of saving the most astonishing feature of not only the purpose of this statue, but also the climax to what is happening in Italy and the entire world concerning the extraordinary revitalization of Nero and his name. And to answer the question posed in this week’s Eye of Prophecy article, Antichrist and Anzio … What Do They Have In Common? 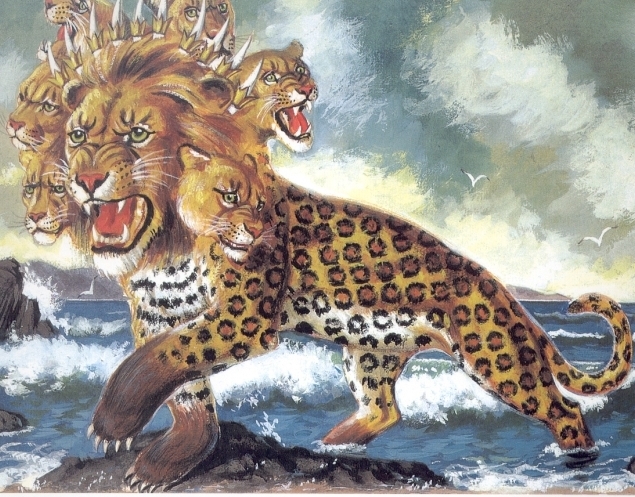 By doing so, to provide yet another milestone marker and fascinating feature of Scripture’s amazing prophecy that the Antichrist beast will reappear from the Abyss/Sea, having already died before John saw the beast himself (Revelation 13:1 and 17:7-8). “The plaque gives his full ruling name—Nerone Claudio Cesare Augusto Germanico—and memorializes his birth here in Anzio on December 15, A.D. 37” (Italics for emphasis). That is what Antichrist and Anzio have in common … Nero’s birth place! 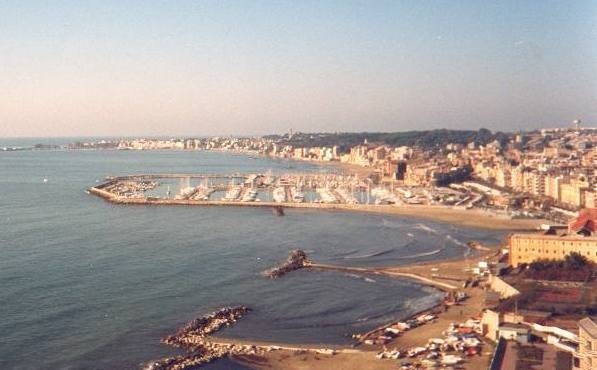 Modern-day Anzio occupies a portion of the ancient Roman territory called Antium. Nero was born in Antium. 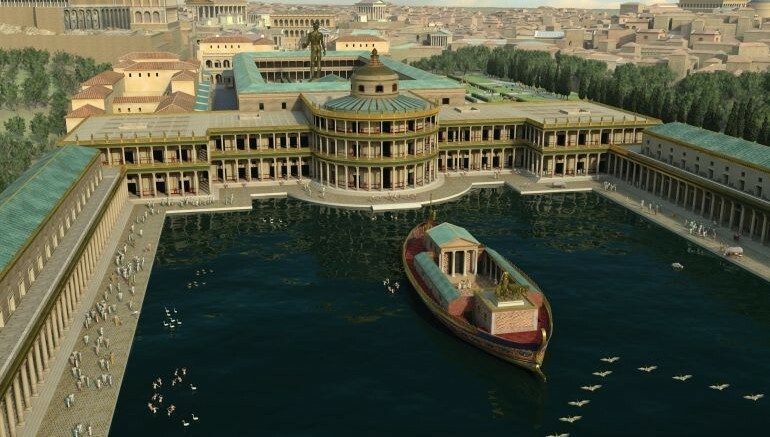 Several wealthy Romans built vacation style villas along Antium’s shore line, the most famous of which was the Villa of Nero, spread over nearly one-half mile of seafront property. *Note: That is the statue mentioned/pictured just a few paragraphs ago. “When I was a boy, I used to swim among the ruins of the villa. As children, we were taught that he was evil—among the worst emperors of all. Doing a little research, I came to conclude that it’s not true. I consider Nero to be a good, even great emperor, and maybe the most beloved of the entire empire. He was a great reformer. The senators were rich, and the owned slaves. He took from them and gave to the poor. He was the first socialist! A pause here to comment on the Mayor of Anzio’s statement that only a few Christians were killed by Nero (as if “only a few” would exonerate Nero’s cruel and callous culpability). This is not historically accurate. The number of Christians killed in the first century will never be known for sure. Some historians postulate that the estimated 20,000 Christians killed during Emperor Diocletian’s reign (81-96 AD) exceeded the thousands killed by Nero. 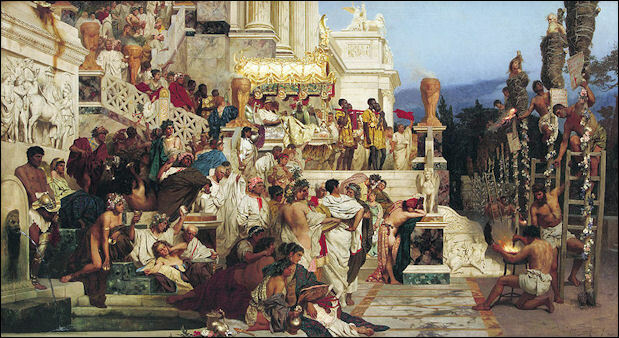 Yet, one fact is certain: The mass slaughter of Christians including the Apostles Paul and Peter began with Nero. Nero’s sordid savagery was so excessive that some of the Roman citizens who loved Nero were embarrassed if not shocked that their beloved Caesar could do such a thing. Even then it wasn’t that Christians were being killed in great numbers; it was the gruesome means Nero used to murder them. “Accordingly first those were arrested who confessed they were Christians; next on their information, a vast multitude were convicted, not so much on the charge of burning the city, as of ‘hating the human race’” (italics for emphasis). I highlighted vast multitudes to demonstrate that considerably more than “only a few” (phrase used by Anzio’s mayor) Christians and those accused of being Christians were “convicted.” If they were convicted, you can bet that most of them were executed. To rationalize his obvious fondness of Nero and to be one of many wanting to change Nero’s image from a sadistic dictator to a benevolent monarch, it appears that Anzio’s mayor either deliberately or inadvertently (though some ignorance of history) tried to defend Nero’s brutality by comparing it to another Roman emperor. The persecution of Christians begun by Nero continued, off and on with varying degrees of severity, until the Roman Emperor Constantine actually declared Christianity as the state religion of the Roman Empire in the early 4th century A.D. From that came the Roman Catholic Church which not long thereafter (continuing for hundreds of years) killed more true born-again Christians (and Jews) than did its predecessor, the political Roman Empire. Very soon after the Rapture, God will release Nero from his 2,000-year confinement in the Abyss. This “miraculous” reappearance from what the world will consider a resurrection from the grave will stun many left behind on earth … to the point of complete allegiance to and worship of both Nero and Satan. In my book and several Eye of Prophecy articles, I’ve provided extensive documentation from Scripture and from history to show the beast who had died would “come up out of the Abyss” (Revelation 17) and will “rise from the Sea” (Revelation 13). Because Nero is the Antichrist beast, that Sea will be the Mediterranean. Granted, the following proposal is speculation, but a supposition based on compelling correlation between Biblical prophecy and 1st century history as related to the near future reappearance of the Antichrist. Proposal: Nero will arise from the sea near Anzio (what he will call Antium), his place of birth. His spectacular reappearance and triumphant arrival will be jubilantly celebrated first by the citizens of Anzio, then by all of Italy upon his grand entrance into Rome. Then by the entire world. It’s one of several ways in which he will imitate (in a mocking sarcastic way) the things that Messiah Jesus said and did. Jesus told his disciples to spread the Gospel—Good News of God’s salvation offered through the death, burial, and resurrection of God’s Son—first to Jerusalem, then Judea/Samaria, finally to the ends of the earth (Acts 1:8). For the counterfeit Messiah, anti-Christ Nero: first in Anzio, then in Rome/Italy, then over the entire planet. Here is an excerpt from Eye of Prophecy article, Soon Comes the Antichrist … Straight From the Abyss Part II (Posted 8-27-16) … In italics. When Nero returns he will strike up a liaison with the Holy Roman Empire (Roman Catholic Church). Soon, thereafter, he will replace this brief partnership with his ten-nation coalition; he will annihilate what he considers to be the usurper (Holy See) to the true Roman Empire. Then he will resume his savage persecution and killing of Tribulation saints (Revelation 13:7), and also launch a Tribulation ending assault against Israel. That final attack on the apple of God’s eye will seal Nero’s fate. “He (Antichrist) will enter the glorious land of Israel, and many nations will fall … He will conquer many countries, and even Egypt will not escape … He will stop between the glorious holy mountain (Jerusalem) and the sea (Mediterranean) and will pitch his royal tents. But while he is there, his time will suddenly run out, and no one will help him” (Daniel 11:41-42 & 45, parenthesis mine). During that final battle of Armageddon when Messiah Jesus returns physically to earth, all Raptured believers and resurrected Tribulation saints will be with him. “Together (the Antichrist beast and his ten-nation confederation) they will go to war against the Lamb, but the Lamb will defeat them because he is Lord of all lords and King of all kings. And his chosen and faithful ones will be with him” (Revelation 17:14, parenthesis mine). Also, see Revelation 19:11-21. The Day of the Lord is near … so very near. Scan the globe. What do you see? Are you facing reality? If so, then you can’t help but notice that Planet Earth is enveloped in physical terror and spiritual/moral darkness … teetering on an axis of evil, ready to fall into an Abyss of destruction. I’m sorry, but a head-in-the-sand optimism for a human solution isn’t enough to change the irreconcilable divisions we see all over the world. Left against the right; rich and poor; black and white; freedom vs. totalitarian Islamic subjugation; nationalism opposed to globalism; and any other polar divisions you can think of. Messiah Jesus will soon return to make all things right. He will bring truth, justice, and Shalom (peace). “For the time is coming, says the Lord, when I will raise up a righteous descendant from King David’s line. He will be a King who rules with wisdom. He will do what is just and right throughout the land. And this will be his name: The LORD is Our Righteousness. 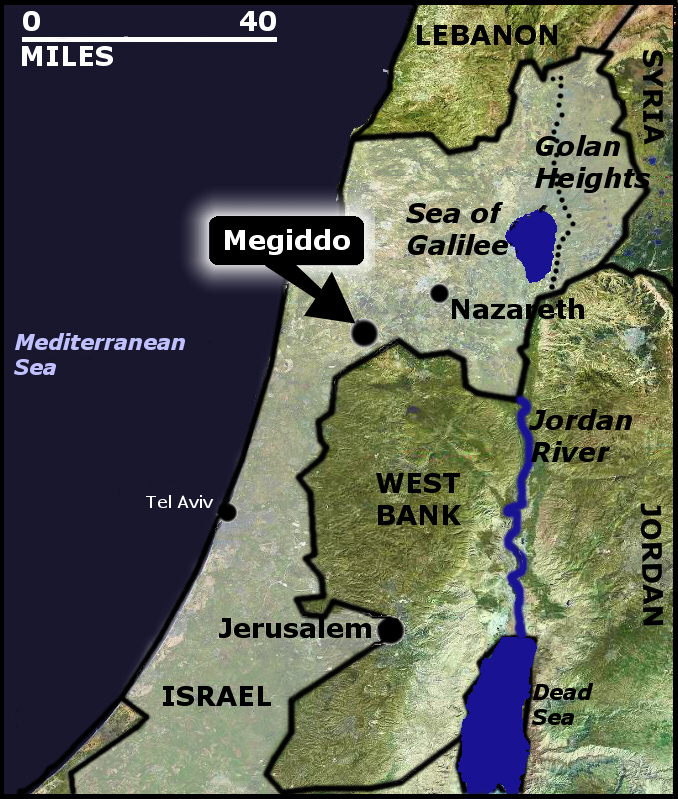 In that day Judah will be saved, and Israel will live in safety” (Jeremiah 23:5-6).